The Glasgow show on Marillion's 'Less Is More' acoustic tour is the one and only time, from the numerous live experiences I have of the band, that I have left one of their shows decidedly underwhelmed. So with that in mind, it would be fair to suggest I approached the DVD version of 'Live From Cadogan Hall', which was the last show on the same tour, with a little trepidation. On the night I saw this show the small venue was oversold, the hand dryer in the gents loo was louder than the band on stage and they refused to play 'It's Not Your Fault' because "Too many people aren't listening!" (evidently it WAS our fault!). 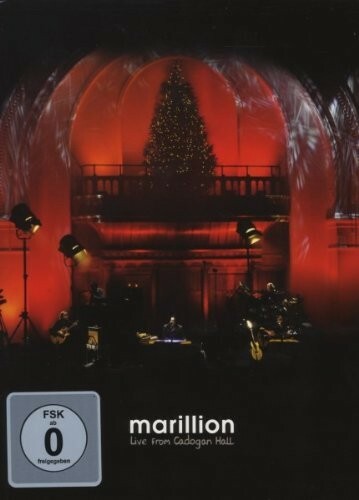 So to have the opportunity to watch Marillion present the same show in the beautiful Cadogan Hall, on a stage big enough to hold the plethora of dulcimers, xylophones, traps, glockenspiels and auto-harps, and with Mr Hogarth in a more convivial mood, let me see the wonderful experience I should have had! I'm not convinced that I ever thought that watching Pete Trewavas plonking away on a xylophone, or hearing Mark Kelly play the theme to 'Vision On' (some of the between song banter is hilarious) on glockenspiel could be so rewarding, but when the results are as spectacular as they are on this DVD, then there is no doubt that they are. With the first disc in this two disc set being a run through of the recent acoustic 'Less Is More' studio album, songs such as 'Go! ', 'The Space' and 'If My Heart Were A Ball' are stripped right back to basics and rebuilt in an entirely different manner. It is very interesting watching the concentration on the faces as Hogarth, Kelly and Trewavas as they play all manner of unusual instruments, and whilst they all do a sterling job, they do look far more comfortable when playing the instruments they are more accustomed to. Disc two contains the second set of the night, which is made up of songs that are equally as comfortable in this acoustic setting, but which didn't appear on 'Less Is More'. Impressively the music really stands up in this form and loses little of its impact. The band are engaging and the performances make for compelling viewing, with the well shot show giving the opportunity to get up close and personal in a way that not many live DVDs do. The set-list is a great mixture of favourite and less celebrated (although none the less excellent) songs that all shine brightly and the band are visibly having a fantastic time. Disappointingly the DVD doesn't come with any extras at all, although I am led to believe that the Blu-Ray (the first time the band have released a show in that format) does offer a whole host of features including a different version of 'Go! ', 'See It Like A Baby' and snippets from the band's Racket TV, as well as an audio version of the 'Less Is More' album that started this project. 'Live From Cadogan Hall' is a fantastic DVD that allows casual fans the opportunity to see a band right at the top of their game, but in a completely different light from normal and for ardent fans is a required purchase.